One of the best virals we’ve seen recently is this. 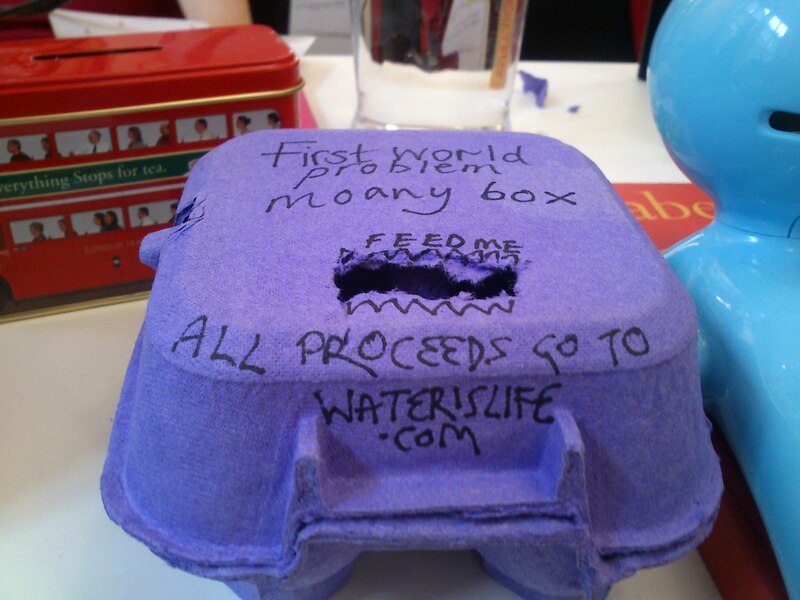 It’s so good that Nat and I created a real ‘first world problem jar’ in its honour out of a Cadbury’s eggbox. Here she is, next to Billy the Sellotape Dispenser. Here are just a few of the RIDICULOUS AND ENTIRELY UNACCEPTABLE first world moans that we have overheard here in these four walls. I hate when…The fruit’s delivered late. I hate that…Since we moved desks, we now have to walk ALL THE WAY UPSTAIRS to go to the loo. And finally; this one is the absolute worst. The other day ‘some creatives’ went for a wrap lunch at one of the ‘trendiest’ restaurants in london, and ordered a celebratory Bellini. It came in a common-or-garden tumbler shaped glass and everyone couldn’t help being disappointed that it wasn’t in an ACTUAL champagne glass? Unacceptable. Rest assured that everyone involved has now sufficiently off-set their pathetic whines! If you find yourself doing a first world moan – whether aloud or internally – we’d be happy to help absolve you. You can now donate in a virtual capacity by commenting or tweeting @loreleimathias and I’ll put some coins in for you. That’s right, I have finally given in and joined the tweeting masses. If you’re so inclined you can follow my ramblings of little consequence here.